Starfish Family Services is working on a “playbook” to enable other child-care providers to replicate its service model, which combines early childhood education with behavioral health, parent support and an approach that takes into account traumatic experiences and their effects on behavior. To do that, the nonprofit first is working to define and standardize the model within its own operations. Traumas, such as the loss of a parent, an unsafe living environment or family member addicted to drugs or alcohol often get in the way of children’s learning, healthy development and growth, said Starfish CEO Ann Kalass. “We’re trying to reframe our work with children from ‘why is this child bad?’ … throwing a temper tantrum or acting out, to (asking) what happened to this child that makes him or her act that way and bringing that lens to how we work with kids,” she said. Starfish provides early childhood education to low-income children in Wayne County, behavioral health services and programs to support parents and families. 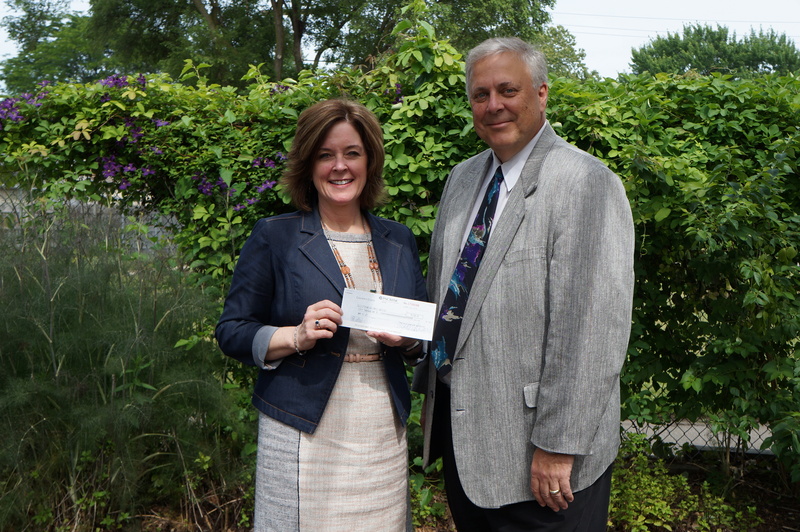 The Ralph C. Wilson Jr. Foundation provided a $250,000 grant to fund Starfish’s yearlong standardization effort. With the Starfish service model, therapists visit families at home to assess what’s going on there and what the families’ needs are. Then they work to connect them to services that can help meet those needs. Starfish also focuses on the parents’ mental health, their relationship with their child — from prenatal to age 8 — and the child’s development. The group also embedded behavioral health consultants at all of its early childhood centers and is training its staff and consulting with parents to help them understand how to support children who have been traumatized. The model is showing promising outcomes, Kalass said. She added that about 79 percent of the 4-year-old children in Starfish’s seven early education centers in western Wayne County were ready to enter kindergarten in the fall of 2017. Replicating the model is a goal in Starfish’s three-year strategic plan. The agency is always exploring alternative business models to ensure its programs are sustainable and well-funded, but it hasn’t yet decided about whether it will license its program to others, Kalass said. Inkster-based Starfish has linked behavioral health to early childhood programs for more than a decade. Two years ago, it committed to universal trauma screening, as well. While the Inkster-based nonprofit employs the integrated and trauma-focused approach at its early childhood centers, it’s looking to standardize and strengthen it at those locations, Kalass said. It’s also working toward bringing the trauma-centered approach to the Thrive By Five collaborative’s 16 centers across the city, something that interests other member agencies, including Focus: Hope, Order of the Fisherman Head Start Ministries, American Indian Health and Family Services and Development Centers, she said. 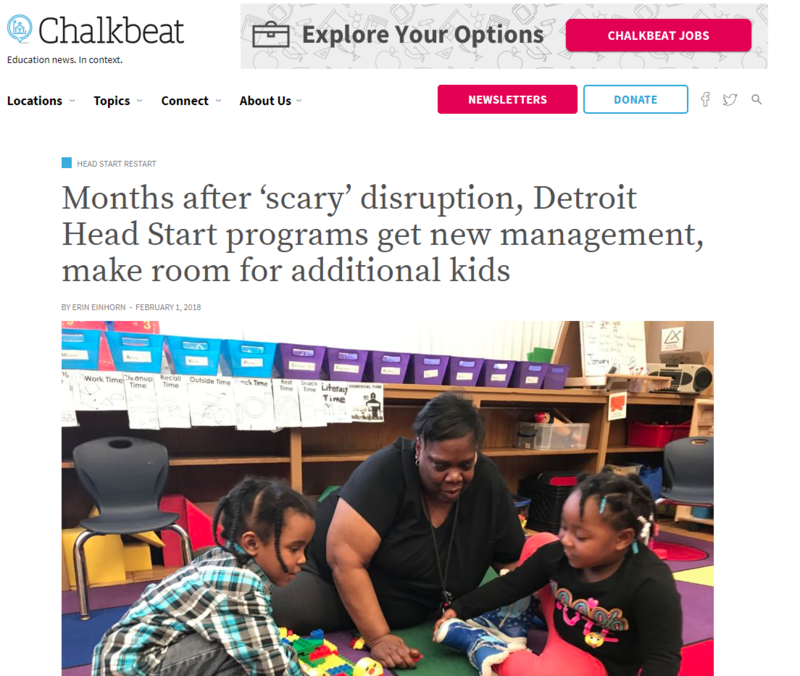 Starfish, which is operating on a $40 million budget, has taken on direct service at four of the Detroit early childhood centers in the collaborative. Southwest Solutions, which ceased offering early childhood services last fall over funding issues, previously operated those sites. Other centers Southwest operated are now under the management of the other collaborative partners as part of the closure of some centers and opening of others, Kalass said. Are You a Behavioral Health Professional? 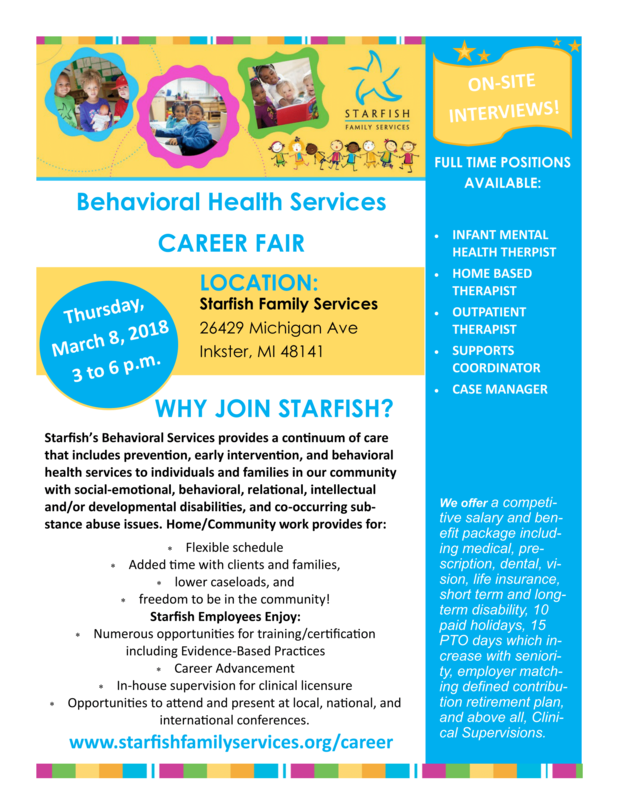 Visit our Behavioral Health Service Career Fair on March 8! Our Behavioral Health team provides clinical supervision for all therapists, group supervision, professional development opportunities (including participating in national and international conferences), and a full employee benefits package! See the entire list of our benefits here. We are a highly passionate workforce who work in the community every day to make a difference in the lives of our clients and their families! 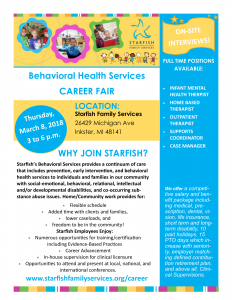 The Behavioral Health Services Career Fair will be held on Thursday, March 8, 2018, from 3:00pm-6:00pm at our Michigan Avenue Building (26429 Michigan Ave., Inkster MI 48141). Interviews for our available positions will be conducted on-site! Bring several copies of your resume and references to be considered. We can’t wait to meet you!